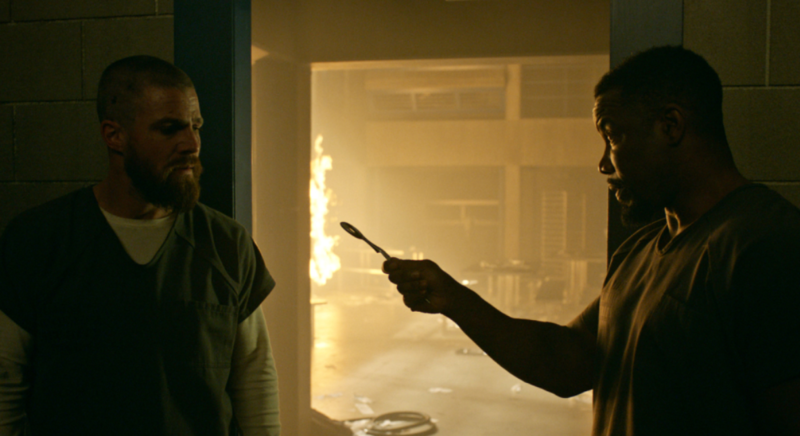 If you wanted an Arrow episode that was fast-paced, full of action and pulsating moments, there was no better episode then “The Slabside Redemption,” which saw the prison confrontation of Oliver Queen (Stephen Amell) and Ricardo “The Dragon” Diaz (Kirk Acevedo). Remember the excitement of the first season of Prison Break? Well instead of Michael Scofield planning to break brother Lincoln Burrows out of prison, we had Ricardo Diaz executing a plan that involved breaking into Slabside for a final confrontation with his nemesis Oliver Queen. It’s amazing how much Ricardo Diaz has gotten away with. Even with the resources of Team Arrow combined with Star City PD, A.R.G.U.S and the FBI, this one man seemed to be a step ahead of everyone. When you have Oliver making a deal with the feds, you knew things were desperate. As the last season ended, Oliver was arrested and imprisoned while Diaz was free to terrorize those nearest and dearest to Queen, especially wife Felicity (Emily Bett Rickards) and son William. Felicity managed to fight off Diaz and then sent William away for his protection. The clever Ms. Smoak/Mrs. Queen was resourceful in helping the authorities arrest Diaz. But remember…Dragon…Nine lives…Diaz still got the upper hand. Into Slabside he strolls. Oliver was shocked to see Diaz as his visitor. Ricardo taunted Queen. 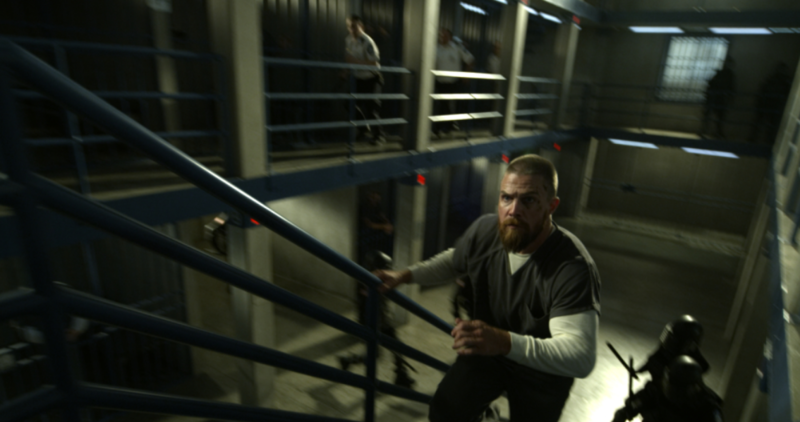 Next it was rallying up the troops a/k/a the prisoners for a little “let’s kick the asses of the guards.” Soon, Oliver was joining forces with former prison enemies like Turner and teaming up with guards. Then it was time for the fight we all were waiting for: Diaz vs. Queen. Both of these men are skilled fighters; Diaz ready to breathe fire on Oliver. But in the end, Oliver emerges victorious. Diaz is put behind bars and Queen has a long waited reunion with Felicity. The writers of “The Slabside Redemption” were wise enough to avoid anything that would distract viewers for the prison drama/action. No fast forward scenes or other characters except those pivotal to what was happening at Slabside i.e. Oliver, Diaz, Turner, Stanley and Prison Guard Felton. I appreciated this decision. I can’t count how many times I’ve watched a film or television show where the main drama was inter-cut with long and unwanted other scenes. I mean c’mon…we already have to deal with commercial breaks, I think I would have screamed at the television if I saw Adult William and Older Dinah talking about the demise of Future Felicity! (Though I’m curious about this, I could wait for any reveals in another episode). 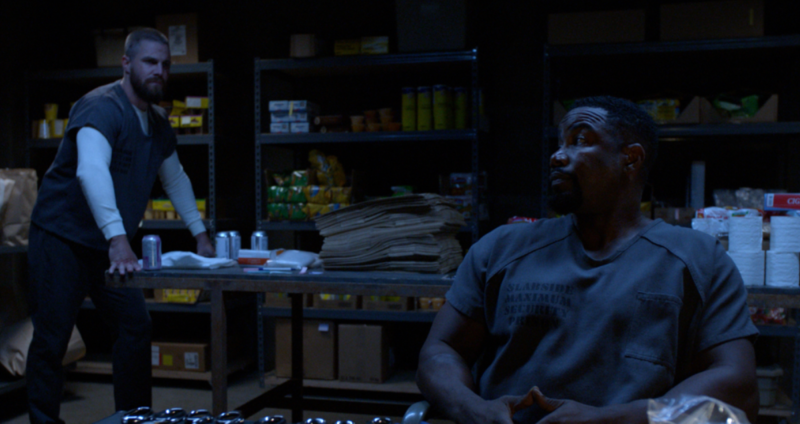 But in “The Slabside Redemption” it was just 41 minutes of prison goodness (or badness…remember Diaz and his revenge). Stephen Amell has mastered everything there is to know about Oliver Queen. His guilt. His torture over the ramifications of his actions. What can’t I say about Amell that hasn’t already been said in countless other articles? So, let me talk about Kirk Acevedo as Ricardo Diaz. If you can’t concentrate reading this article it’s because of the sound of my loud clapping to applaud Acevedo’s work. Kirk Acevedo’s portrayal of Ricard Diaz has been nothing short of chillingly brilliant. I’ve watched Arrow since it’s premiere on October 10, 2012. Oliver has faced some deadly foes like Damian Darhk, Malcolm Merlyn and Adrian Chase to name a few. But in my opinion no matter how crazy these men were, none hold a candle to Diaz. 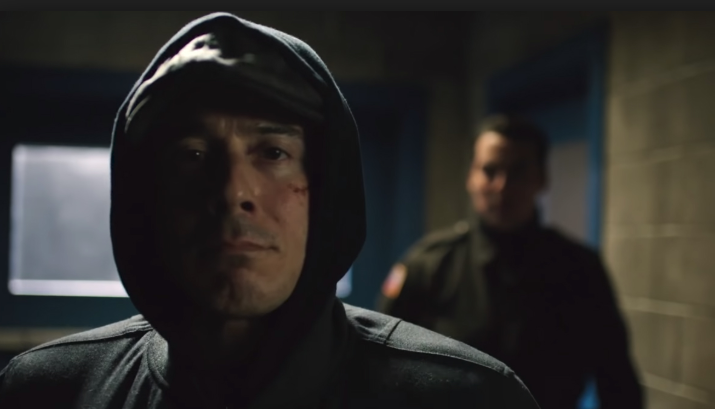 Once I saw the Season 6 episode titled “The Dragon” that showed the backstory of Ricardo Diaz where the Young Diaz was bullied by a teen named Jesse, harbored a lifetime grudge then burned an Adult Jesse alive (to the shock of Black Siren), I knew Oliver had never met someone as cruel as Ricardo Diaz (and Adrian Chase came close). Kirk Acevedo’s facial and voice inflections convey Diaz’s deadly intentions. These are the tools of a skilled and talented actor. I’m torn. 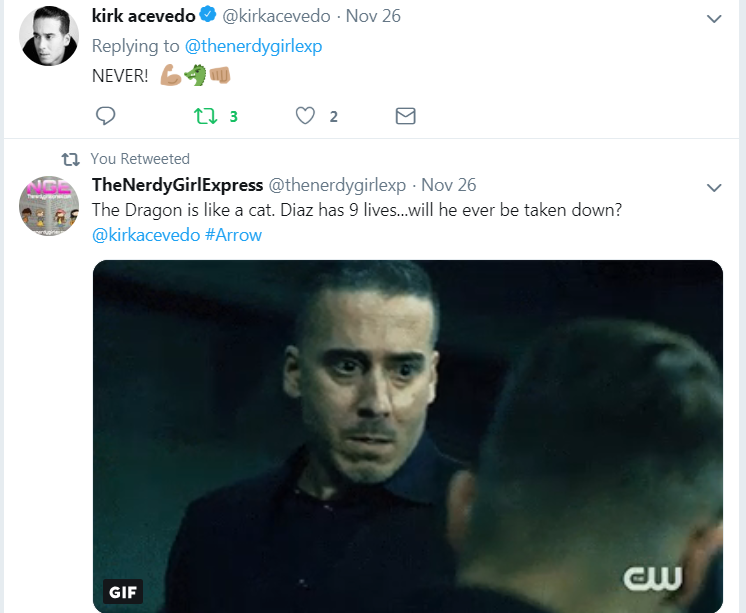 Although I want Ricardo Diaz to pay for his reign of terror, I don’t want “The Dragon” to get what’s coming to him if that means the end of Kirk Acevedo tenure on Arrow. For all the reasons given above and more, I give “The Slabside Redemption” an A+. For me it was the BEST episode of Arrow’s Season 7 so far. Comments? Sound off below. Or tweet @thenerdygirlexp and @stacyamiller85 .